Barcelona with Kids: 5 Fantastic Things to do in Barcelona as a Family! 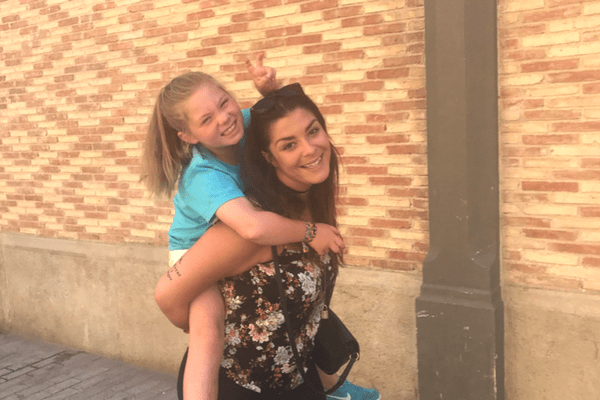 After having such an incredible time with my family here in Madrid this March, I realized how passionate I am about helping others make the most of traveling with kids. 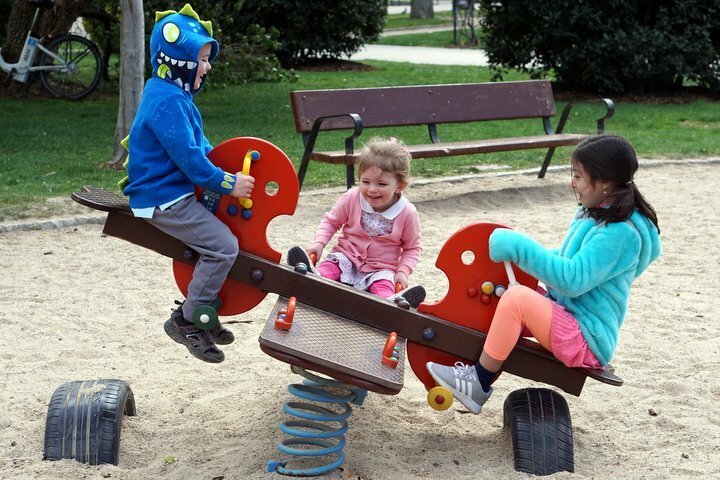 I saw firsthand how my nieces and nephews enjoyed and learned so much in Spain, and how being in such a different country has already shaped their young minds. Every time I talk to them on the phone, they mention something about the trip– it’s adorable, and makes me proud I could share our culture with them! With that in mind, I want to keep sharing more tips for traveling with kids in Spain here on the blog. But I know I’ll need help to do so! My first “helper” is Misty Barker, a Barcelona based writer and also a fantastic tour guide and marketing expert for Devour Tours. Misty has an eight-year-old daughter and lots of experience making Barcelona kid friendly! She even planned our very own Barcelona for Kids Walking Tour— a special tour for families in Barcelona’s city center. More on that later– for now, here are Misty’s top tips for Barcelona with kids! 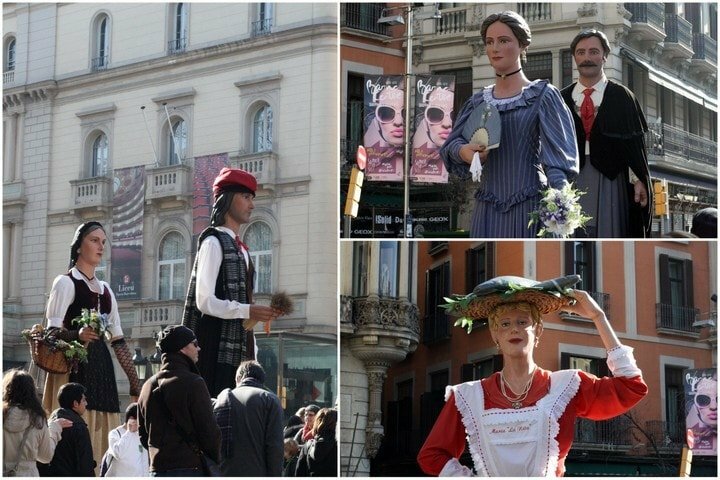 If you get to see Barcelona’s giants while in town, your kids will love it! When I first moved to Barcelona, I fell in love…bigtime! The city is one of the most vibrant and beautiful places I have ever lived and is crammed full of hidden gems just waiting to be discovered in every neighborhood. From stunning architecture to beautiful open spaces—it truly is a city made for exploring. 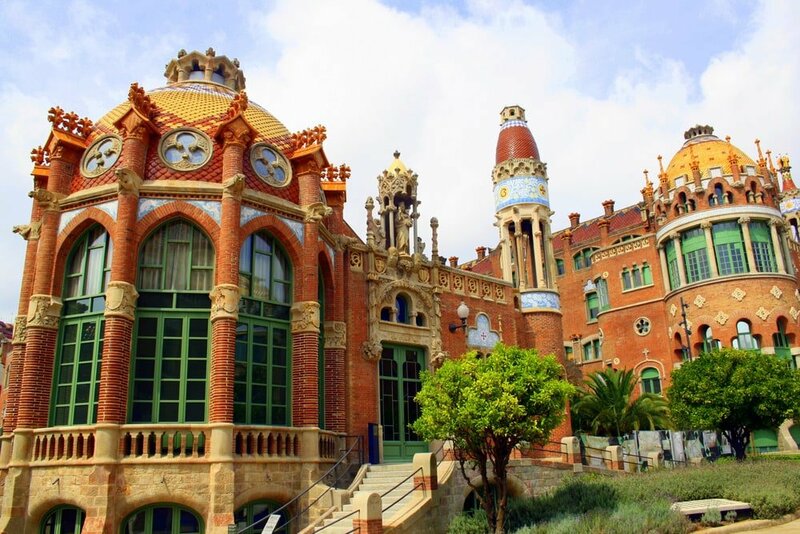 Read more: Check out our Barcelona neighborhood guide! So, imagine the increase in my stress levels when I was finally bringing my daughter here, for the first time! I’m going to be really honest, I was terrified! What if she didn’t love it as much as I did? What if she didn’t want to live here? Would I have to end my love affair with this incredible place?! I needed a plan! And quickly! 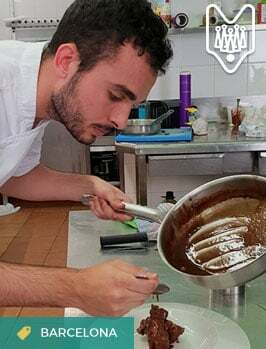 Working in the tourism and food industry, it’s expected that I know, well, everything! 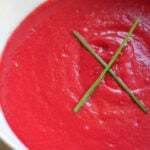 When it comes to food, wine, and fun I like to think of myself as an expert. But that being said, I don’t exactly head to the playground every morning or hang out in toy shops! So I did what any mother would do – I went on a mission to arm myself with information. Unfortunately, there wasn’t really that much out there. Which is why, after my daughter’s visit I decided to piece together my top five list of things to do in Barcelona with kids. 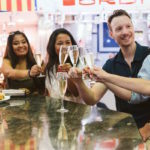 From the best foodie stops for children to family friendly Barcelona kids tours– and plenty of tips for things to do with kids in Barcelona! Needless to say, my beautiful mini-me did indeed love Barcelona as much, if not more than I do. I hope this list helps you create some great holiday memories for you and your little explorers! For the curious and childlike mind, imagination is key. This place has definitely got the ‘wow’ factor– that’s for sure! Cosmo Caixa is, without a doubt, one of my favorite ways to spend a day in Barcelona—even without children! It’s crammed full of activities and exhibitions to captivate the minds of even the most restless! Top Tip: Do not miss out on Toca Toca! 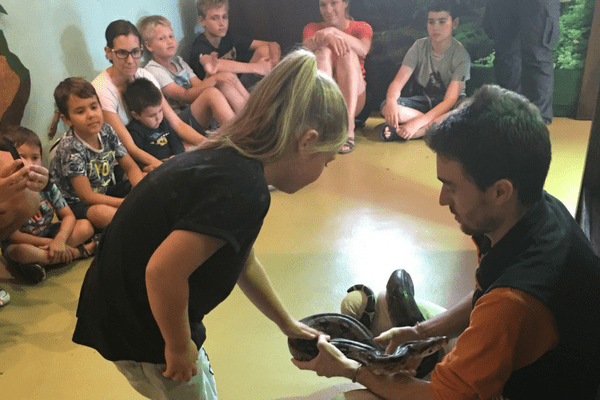 It’s an amazing activity where the children can actually touch exotic animals and learn all about their habitats. My daughter loved touching the snakes and lizards, while I hid behind her! Booking is essential so arrive early! 2. Aquariums & Ice cream! I’m all about getting the most out of your day, especially when on holidays. That’s why I always advise people to check out the area around wherever they plan on visiting that day. It’s especially important when in Barcelona with kids because there are just so many places you will want to show them. So prepare in advance and you won’t miss out! 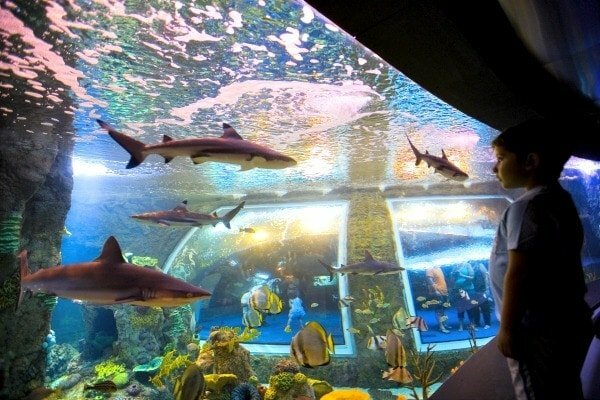 The aquarium in Barcelona is a great day out—and not just for kids either. With lots of great activities, kids will be kept well entertained. When they’ve explored enough, cool down with an ice cream from quite possibly one of the coolest places in Barceloneta (literally!) 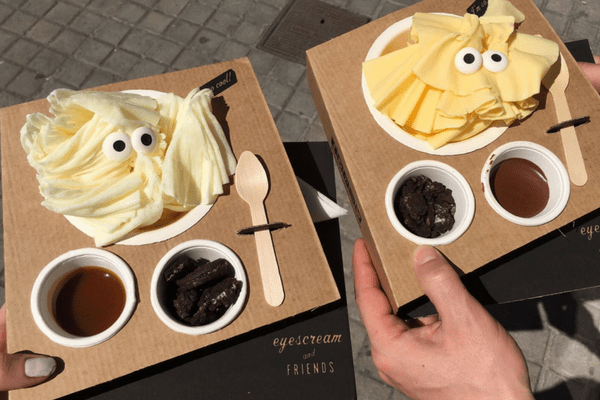 Every kid will love Eyescream and Friends, picking and choosing flavors and topping to create some of the cutest and tastiest ice cream in town. Perfect! Top Tip: Why not head to Barceloneta beach for a late afternoon swim to refresh before a busy evening ahead? Don’t forget the sunscreen! 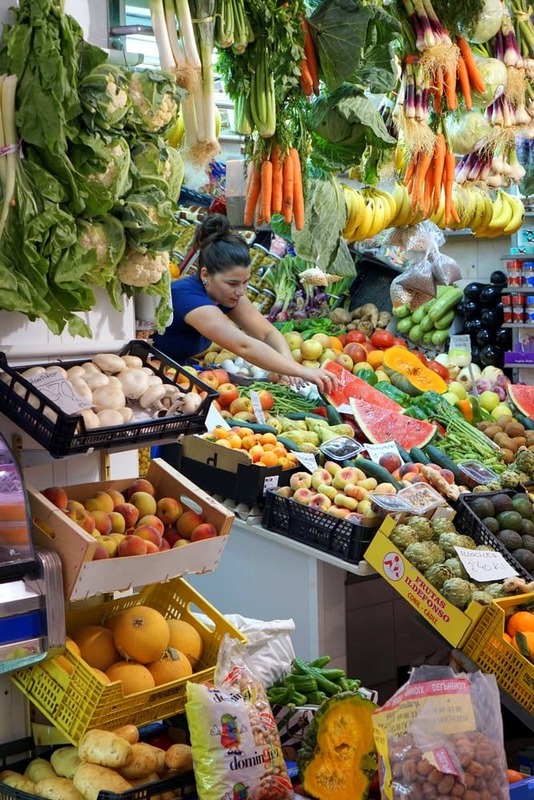 Tip: We visit the Santa Catarina Market on our Tastes, Tapas & Traditions of Barcelona Food Tour— if your kids are food lovers this 3.5-hour tour is fun for the whole family! 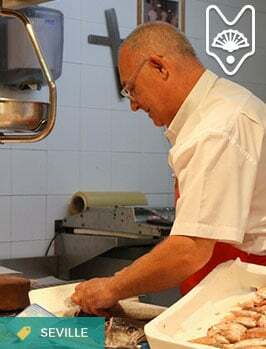 Being in Barcelona with kids can be an amazing experience and there’s no one better to show your family around than a local expert. 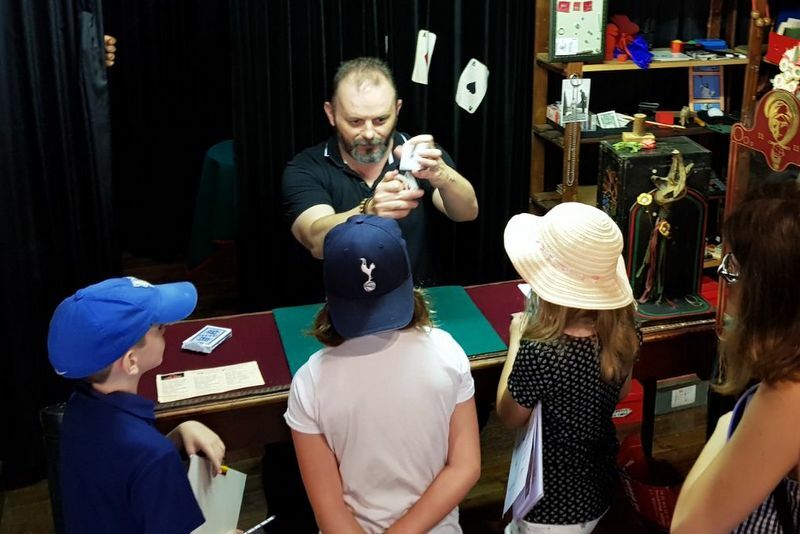 Luckily, the Devour Barcelona team has just created an incredible tour specifically designed for kids between 4 and 12 years old. 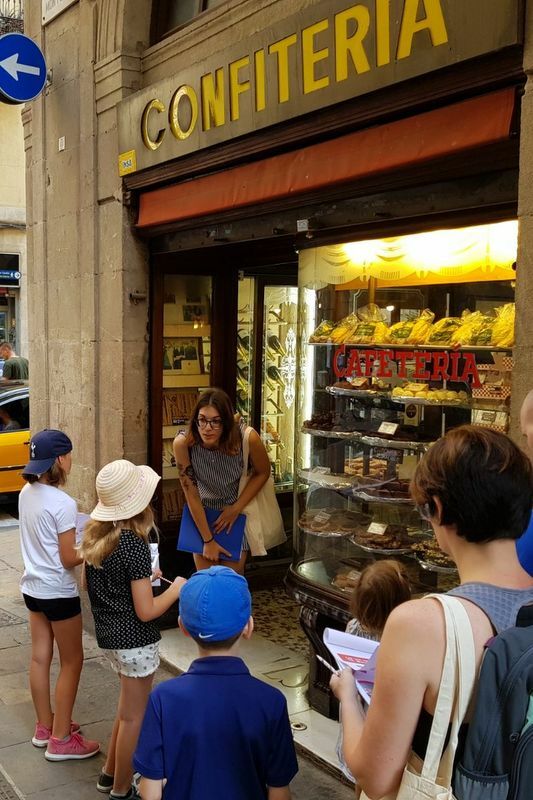 The Barcelona for Kids Walking Tour is a family tour filled with legends and stories along with interactive activities to keep your kids engaged. 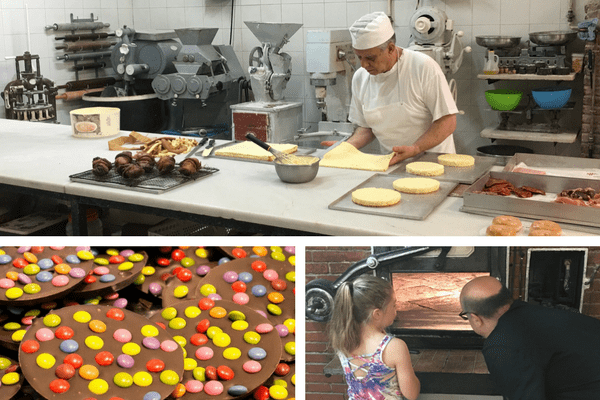 Discovering a family run bakery on our Barcelona kids tour! We visit some of the city’s oldest shops– from candy stores to magic shops and also stop in at the Giants’ Museum to learn all about the legends that make Barcelona so interesting. We also explore Barcelona’s Roman history and the Gothic Quarter, stop by the local market, and taste Spanish foods at multiple locations. And this tour isn’t just for kids– parents will enjoy this one too! It’s 3.5 hours of visiting bakeries, tasting some incredible Spanish food and enjoying our unique Catalan culture in Barcelona with kids. Drinks are also included (Spanish style!). Spaces do book up quick so plan in advance and book your tickets online. I promise you won’t be disappointed! Top Tip: There’s a whole host of family friendly tours in Barcelona. The best word of advice though is to try to book this at the start of your trip so you have time to visit anywhere you spotted during the day. What would a holiday be without visiting a wonderful theme park? 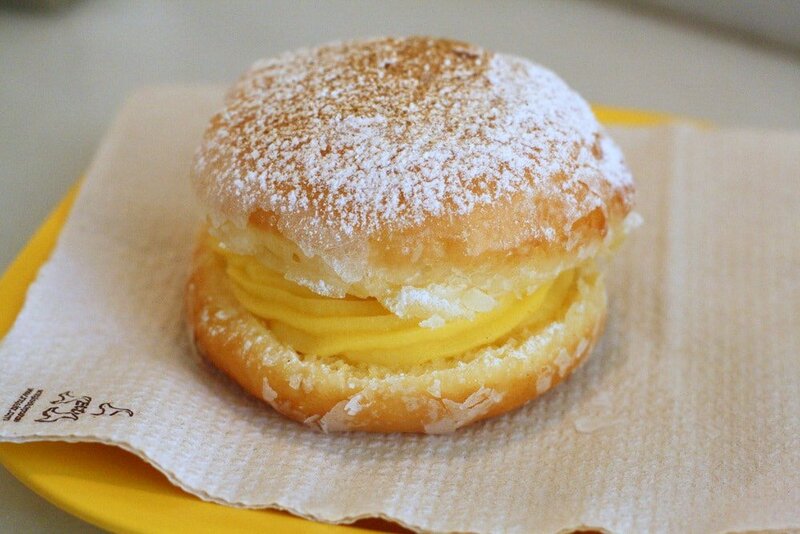 Not to mention one that sits at 500 meters above sea level! Yes, this place truly is a wonder. 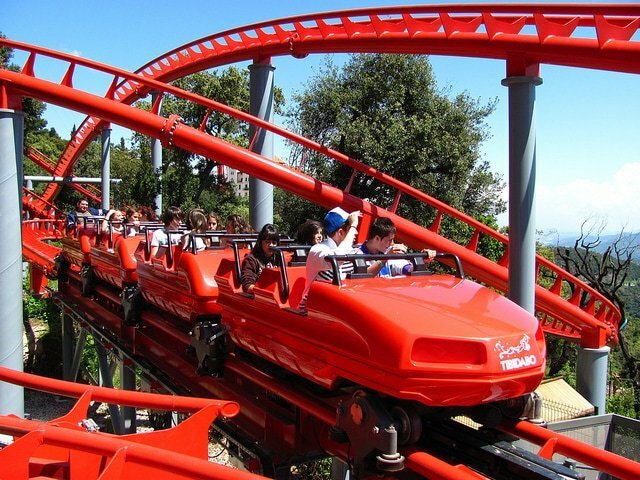 Spend an evening on the highest mountain in Barcelona and enjoy the thrills of one of Europe’s oldest theme parks. 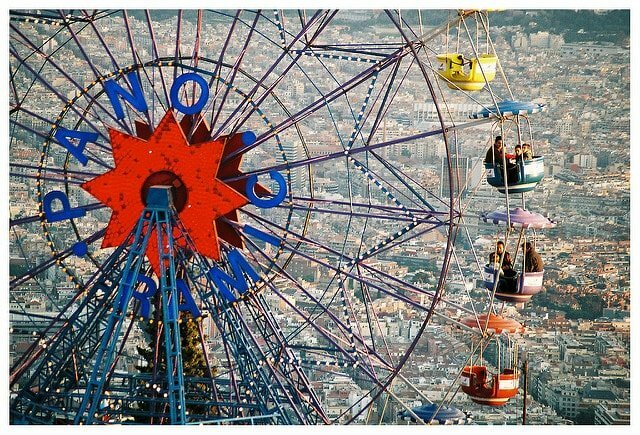 Hop on the magical carousel and sparkling Ferris wheel to check out some of Barcelona’s incredible panoramic views that will stay with you long after your trip is over. No holiday to Barcelona with kids would be complete without a visit. Placate your inner child while your kids laugh, scream, and experience all this incredible place has to offer. Of course, I could go on and on about where to go and what to see, but I can’t ruin all the fun! Half of the best part of traveling with kids is exploring. So, get out there, ask a local, go for a wander and most importantly enjoy every minute you get to spend with your mini-adventurers! 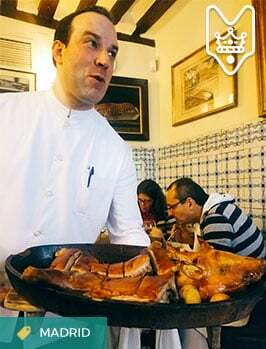 For some more great ideas on where to eat in Barcelona with kids and some other top tips to get the most out of your vacation check out some of our Barcelona with kids blogs. And as always—please get in touch if you want any advice or have any suggestions for our readers! I love to hear your fun and interesting ideas! After traveling (and eating) her way through most of Europe and the Balearic Islands in her early 20s, Misty decided to leave Ireland for good and pursue her foodie dreams. She fell in love with Barcelona the minute she stepped off the plane. Now she works for Devour Tours as a Marketing specialist and leads some of its food tours around the city while being a mother to an awesome little girl and mini-explorer! She is currently in the process of writing her first novel, based in Barcelona. Her daily musings can be found on her blog mistybarker.com and her Facebook & Instagram page. Pingback: Top 5 Day Trips from Barcelona: Explore Magical Mountains, Beaches & Beyond!